Year after year, François Sorg, son of Bruno, puts out a range of pure, complex, lovely wines that are great illustrations of their terroir. The top-range Rieslings are made from Grand Cru Florimont in Ingersheim and Grand Cru Pfersigberg in Eguisheim. 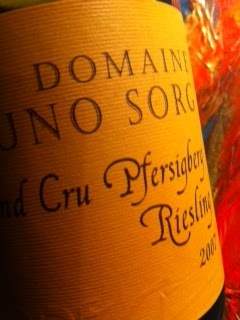 While the former defines purity and elegance, the latter defines complexity and minerality. However, they share the two most important features of any wine of quality - personality and balance. 2007 Riesling Grand Cru Pfersigberg from Bruno Sorg in Eguisheim offers complex, superb and deep aromas of grapefruit, rubber, coffee, ripe exotic fruits and - more importantly - the soils of Eguisheim just after rain. The taste has a trace of bitterness, loads of mature fruit and mouthwatering acidity, but most of all the structure and minerality are first class. A Riesling just like I want it. Price: €11. Along with Val d'Agly in Roussillon, Alsace has the most complex geology in the whole of France and thus in the world. The youngest soils are formed by sand, gravel and stone were deposited from running meltwater that formed deep river beds by the end of the last glaciation 10 000 years ago. Apart from the sheer granite, the oldest soils consist of shale that is approximately 450 million years old! And no other soil type gives such an amazing combination of ripeness, texture, freshness, elegance and finesse that shale! 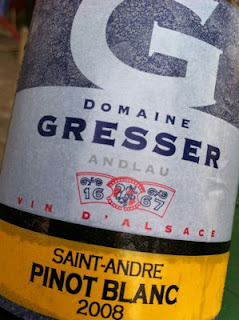 2008 Pinot Blanc Saint-André from Rémy Gresser in Andlau has an amazingly complex nose, with orange, bay leaves, anise, smoke and ripe butter-pear. The taste is medium bodied, silky and elegant with soothing fruit that is in perfect harmony with a racy, good acidity that is not the least aggressive. Price: € 7.